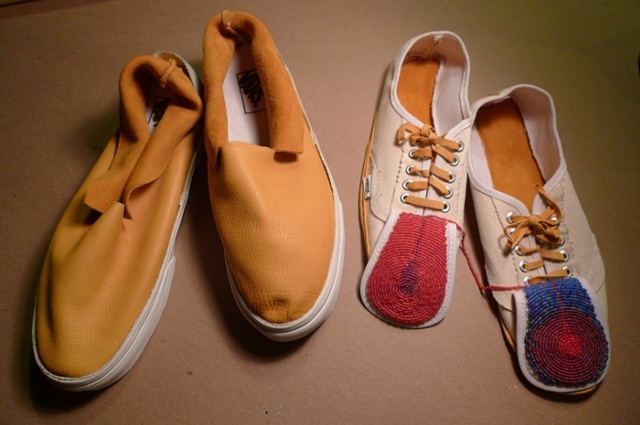 Vans shoes, deerskin, thread, and glass beads. curated by Jason Jenkins and Luke Parnell. In contrast to the moccasin making techniques as taught to me by artist Dan Commanda which describe pattern making from the measurements of a persons foot, I create moccasin patterns from the disassembled insoles and detached running shoe uppers without direct reference to a human foot. The detached canvas Vans uppers reminded me of a moccasin pattern, and I constructed these shoes by playing with moccasin making techniques in response to mass-produced shoe pieces  taking apart and letting the shoe parts suggest how to be reassembled in the way they associated with my knowledge of moccasin making.